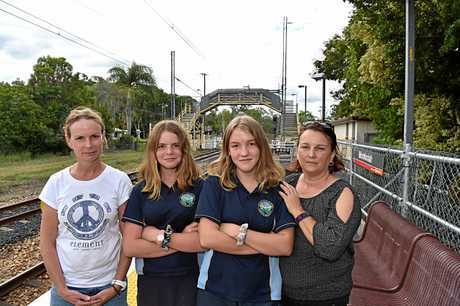 FAMILIES in the Mooloolah Valley catchment are being stung at the hip pocket forced to pay "unaffordable" public transport fees to school while others minutes away pay "next to nothing". 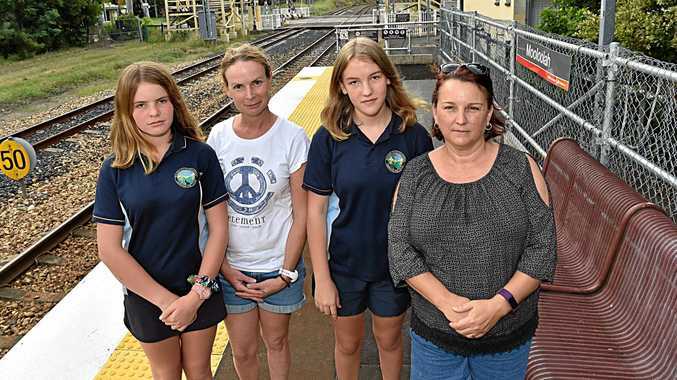 What started out as a simple campaign for a bus service from Mooloolah to Maleny, the closest high school, has turned into a subsidisation plight. The frustrated parents are paying up to $35 to catch a bus per week, per student. How much is too much for transport to school? MP for Glass House Andrew Powell has called for their fees to be wiped in parliament earlier this week. Mooloolah Valley mum Lisa West says her children suffer the most as the fees mean they're unable to pay for sport or extra curricular activities. Ms West drives her middle child Caitlyn to the train station where she gets a bus for a $15 fee. "I can't afford $35 a week, $15 is my limit and I barely afford that," Ms West said. "It's not fair to my kids. They can't play sport as I can't afford it. But their mates get free or heavily discounted travel. "We go to Maleny cause it's in our catchment zone and it's also a great school." She said residents on the western side of the railway line are getting hit hard, compared to those on Old Gympie Rd or Glenview Rd attend Chancellor State College travelling for cheap. Glass House MP Andrew Powell has been at loggerheads trying to get the issue resolved for years. He took to State Parliament earlier this week to raise the issue. "It's a weird situation, initially we were campaigning just to get a proper bus service, now it's turned to a subsidisation fight," Mr Powell said. "Glass House Country Coaches service are now on board, but the fees must be subsidised so the parents pay less. "Some parents pay next to nothing to go to the school but these families end up paying more in transport costs than actually going to school." Mr Powell reserved praise Glass House Country Coaches for stepping up to the plate. A TransLink spokesman said students in the Mooloolah Valley area currently have transport options available to travel to either Beerwah or Maleny state high schools. "Students attending Beerwah SHS can travel on a Student Travel Assistance Scheme (STAS) designated bus service provided by Buslink and do not incur any costs," the spokesperson said. "Students attending Maleny SHS can travel via train from Mooloolah to Landsborough rail station and via bus from Landsborough station to Maleny SHS. "Alternatively, students may choose to travel on a commercially run bus service provided by Glasshouse Country Coaches from Mooloolah Valley to Maleny SHS. This service is a private fare based service, with the costs set by the operator. "In the Peachester area, secondary students have a safe and accessible service funded under STAS to the closest school, which is Beerwah SHS. "This does not prohibit these students from attending Maleny SHS. Should they choose to however, they would be subject to a fare being charged by the bus operator, along with arranging any other interchanges that are required. "Primary and secondary school students are eligible for concession fares at 50 per cent of an adult go card fare and some may be entitled to additional fare assistance."